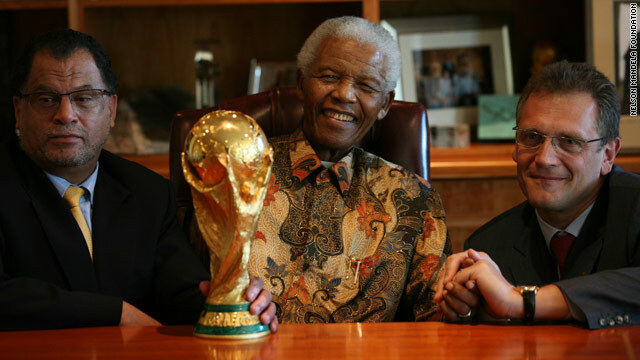 Nelson Mandela, center, with the World Cup trophy and organizing boss Danny Jordaan, left, and FIFA's Jerome Valcke. (CNN) -- Nelson Mandela welcomed the World Cup trophy to South Africa on Thursday, nearly six years after the former freedom fighter and national leader cried tears of joy when the tournament was awarded to the continent for the first time. With 35 days before the soccer showpiece kicks off in Johannesburg, the trophy that 32 teams are hoping to lift come July 11 is about to embark on the final leg of its world tour. On Friday it will go to the township of Khayelitsha on the outskirts of Cape Town before heading through 38 cities and towns in all of the host nation's nine provinces. The 91-year-old Mandela, who in 1994 became South Africa's first democratically-elected president after decades of apartheid rule, was at FIFA's Zurich headquarters in May 2004 when football's governing body awarded his country the right to host the event. "Nelson Mandela was one of the architects of this FIFA World Cup. 'Madiba' is the symbol of this new democratic South Africa," FIFA Secretary General Jerome Valcke said in a statement. "For us there was no way that the trophy would arrive in the country and not be brought first to Mandela. "Nelson Mandela expressed his wish that he would see Bafana Bafana win the FIFA World Cup. We really hope that he will experience together with us the special moment celebrating South Africa's achievements in the stadium." Local organizing committee chief Danny Jordaan was also present as Mandela, who served 27 years in prison before his release in 1990, was reunited with the trophy. "It was so wonderful seeing 'Madiba' in Zurich on the day South Africa won the right to host the 2010 FIFA World Cup, so happy with tears of joy rolling down his cheeks," Jordaan said. "So, it is quite an emotional and joyful moment to be back bringing the trophy to him, a symbol of world football with a global symbol of humanity."